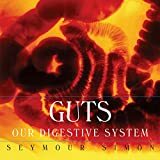 Guts is a picture book for children who want to learn more about the human digestive system. It includes photography, color-enhanced imaging, and views from microscopes in a selection of remarkable pictures. The book is small and the print is big, so it contains limited information, but it still conveys a good proportion of the basic facts. The writing is clear and should be accessible to children willing to make the effort to try to understand. The greatest fault of the book pedagogically is that it separates the text and the pictures almost completely. The pictures are on one page while the text faces it. The presentation would me more interesting visually to combine the two, and it would also help readers to know what are the different parts of the organs or processes depicted. This book would probably not be very useful for use in a school, except as an source for pictures to show students. However, it might be appropriate for some inquisitive children who want to learn about human biology on their own. Thanks to Marysusan Noll for her thoughts on this book, which informed this review.